Pizza is a special case that is worthy of its own attention, so this section will do that. There isn’t as much of a boarder thesis here, and the judgments are more subjective. Part 1 was about more than just restaurants, but Part 2 is almost entirely about pizza. Pizza has distinct sub-genres. I will refer to them into six: New York, Italian, NYC-Italian Hybrid, Chicago, Acceptable Chain and Not Pizza. Also known as real pizza. Reviews of New York style places are unusually unreliable. People evaluate on all the wrong things, so you can’t count on even quite high ratings to signal great pizza (they do reliably mean good service and solid pizza). Go in and look at the pies! One of the great advantages of New York style is that one look tells you almost everything, and any self-respecting place will have pizzas on display for your perusal. Look at the plain pie even if you plan to order toppings, as it contains the most information. Notice whether the pizza is fresh. If the pizza is right out of the oven, that’s pretty great. If it has been lying around for hours, it should be obvious, and that is terrible. New York pizza can survive reheating (Sicilian/Grandma tends to survive best), and still be acceptable eating in an emergency, but it is still never the same afterwards. Reheating any pizza is a tragedy, and a strong argument against getting toppings on individual slices, since they must then almost always be reheated. If you do decide to order plain slices, there is a reasonably large range where it is correct to stop the place from reheating your slices and take them as is. The plain pizza not being hot means the place can’t sell plain pizza, which is basically death. On that last pizza, you’re pretty sad, but if you have to choose, that small slice at about 11:00 with the red tip doesn’t look too bad, if the pizza is hot and you are hungry enough. Some signs of light burning are good, but not required. Signs of areas that have only cheese, areas that are monochrome, are death. Walk away. There is also a look that you can see that says, we are only adding the minimum amount to the crust in order to symbolically represent pizza. That means you are dealing with Dollar Pizza, which is usually Not Pizza but is sometimes just bad pizza. There is no way to actually create a good pie for that price and still make rent. Crust and ingredient quality are harder to judge from appearances. I can get an intuitive read that a place is going to have quality crust because it seems more ‘real’ and less generic, with more texture and varying colors, but this is not that reliable. Ingredient quality does show up some in the visual signals, and too low a price can give away a problem, but the only way to know for sure is to try the pizza. 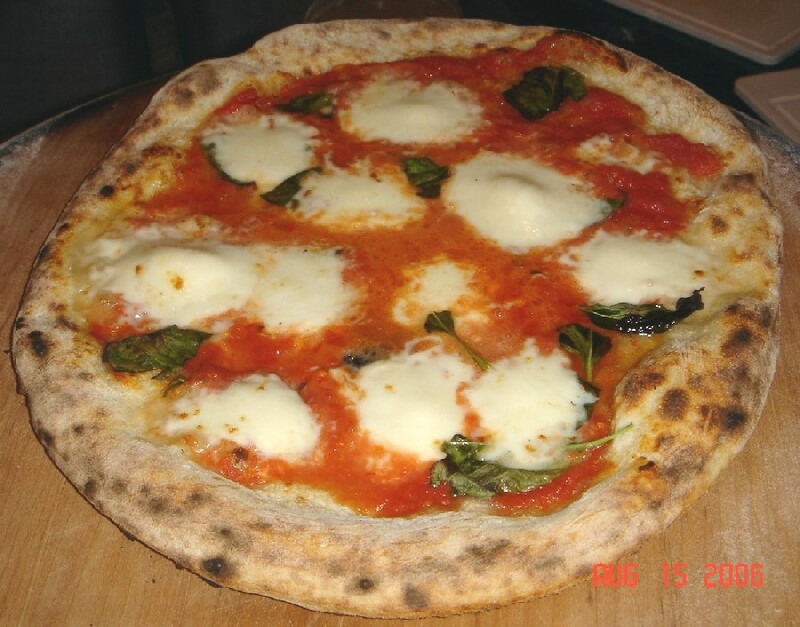 New York places often offer Grandma or Margarita pizzas that use better ingredients than their basic pie, so keep an eye out for those. Also check to see if their Sicilian looks better than their standard pie; the same visual standards can be used. As for toppings, that is a matter of taste. Names matter. You want the place named for a real person associated with the place, ideally an Italian, or failing that a particular pizza sub-style. A fake name like Ray’s or Luigi’s means a low ceiling, although it also does raise the floor slightly, as you can count on what they are going for. There is no economic reason for a high quality New York style pizza place to be large. Smaller is better, and hole in the walls are often great. Cash only and/or not being on standard delivery services can be annoying to deal with, but bodes very well. Displaying an unusually large number of (very much not fresh) pizzas is a bad sign. Such places are saying ‘look at the variety, we have what you want!’ at the expense of having quite old pies out. Much better to make exotic slices on request. Pizzas should be laid out functionally, not primarily for display. Lack of optimization in any aspect of presentation pretty great. The more things they have written by hand with markers, the better, with bonus points for writing on pizza boxes. The true specialist knows how to make pizza, not nice signs! In general, anything that makes a place look old or unique matters even more for pizza places than it does normally. Easy availability of Parmesan cheese, oregano and garlic is a positive sign. Red pepper should be assumed, and not seeing it is a very bad sign. Extensive menus, especially non-pizza menus, are unusually bad. If they are signaling general Italian, or generic American, ignore the pizza offerings. Never order pizza from a place that does not specialize in pizza. 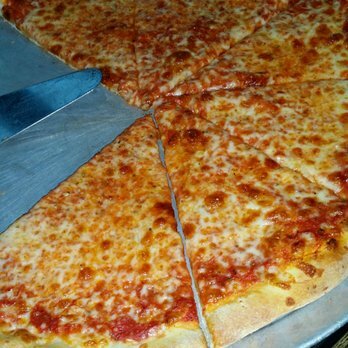 If a New York style place is in a place with plenty of foot traffic and refuses to serve slices, that’s almost a guarantee of quality. Pizza needs to be consumed in a timely manner. Pizza delivery is a sacred trust and will soon be one of the four things Americans are any good at. For the best experience, order a full pizza and eat it in the restaurant, or wait to actually see a pie come out of the oven before buying slices from it. My friend Seth does his best to only eat pizza this way, and there is a lot to be said for that. A few places churn fast enough to offer hot pizza reliably, which as noted above is a huge plus. Do not underestimate the value there, even if the place is otherwise unimpressive. Second best is delivery, as New York style gives you enough time for that, but once you get it, you must eat your first slice immediately, and finish up within ten or at most fifteen minutes. If you are hungry enough to eat it later, I can’t stop you, and it can still be all right, but it is a real shame. Sometimes life calls for sad pizza, but keep it to a minimum. Having a warm or if necessary reheated slice or two is third best and usually a mistake. Italian pizza is an inferior form in terms of allocating its ingredients, but makes up for it with a lighter feel, excellent crust, top quality ingredients and extreme freshness. You always order your own pizza and eat it right away in the restaurant; if you are offered Italian style pizza any other way, just say no, because it does not survive any other way. Similarly, you are counting on them to have rich flavorful sauce, real Buffalo Mozerella and to know how to make a real crust. If any of the steps fail, the result will fall flat. It also costs more. That doesn’t mean it is a bad product. When done right, it is worthwhile, getting out of the way and letting its components shine. I especially like how light the meal is compared to New York style. Italian places are harder to read than New York places because you can’t just look at the pie. Positive signs in my experience are being cramped with tables squeezed in everywhere in a way that feels improvised, being cash only, and feeling old school Italian without any sign of actively trying to look old school Italian (e.g. red and white checkered tablecloths are a very bad sign). The reviews are more reliable here than they are for New York style, since this style is higher status, and other indications are less reliable, so lean on the reviews more. If a place is exceptional, critics will note it. If you don’t see anyone signing a place’s praises, the place is not that good. This is the good stuff. When you see pizzas that look like this, and a sign that says no slices and no delivery, you have probably hit the jackpot. Often there will be a line; it will be worth it! Once you get the pizza, eat at once, as this style keeps as poorly as Italian style. In my experience, this square format has a high floor, above average mean but low ceiling. Ingredient quality is good, but never brilliant, and the pizza overall is similar. When it is bad it is still all right, but it will never get to the top level. These places call themselves “pizza bars” and if you want the bar part of that, the pizza will serve, and keeps similarly to New York style. I have no sage words about this style. It can be done well (although not without an expensive hit to your diet) but it is not for me. If you like huge amounts of melted cheese and calories are not a limiting factor, this can be right for you. 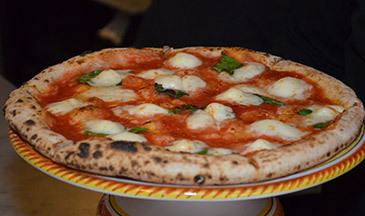 New York has some minor chains like Grimaldi’s, Bravo and Harry’s Italian. Perhaps some day they will perform The Upgrade on pizza chains the same way Starbucks upgraded our coffee and Shake Shack and Five Guys are upgrading our burgers, but for now we are stuck with pre-Upgrade fare. They even have a presence in New York City. To which I say: If you patronize these places within city limits, you’re still better than Hitler, but I did have to think about it. Pizza Hut is underrated. It makes great breadsticks, and the crust of its pizzas is made out of those breadsticks. The marinara sauce is much better than one would expect. The problem with Pizza Hut is that its cheese is reasonable when hot ages especially poorly. They used to focus on a relaxed, slow restaurant experience where you could get their pizza at its best, and in that context you could do much worse. Now, they are focusing on delivery (which they are not good at), ‘express’ locations and buffets, none of which are good ideas. If you can find an old-school, sit down Pizza Hut with table service, that is not a bad choice in many places. Anything less and you should avoid. Ask for extra marinara sauce. Domino’s Pizza is overrated. I realize how lowly it is rated, and that being overrated at that point is hard, but they did it. There is a reason their ads say “yes, we know our pizza used to be the actual worst, but look, it’s less awful now and contains things from actual cows!’ People claim their new version is not as bad, and I believe them because how could it not be, but if you look at it, you know that there is still a long, long way to go. Not Pizza. Papa John’s Pizza is correctly rated. It has been described by someone I know as ‘for when you have given up on life.’ This seems about right. If you have given up and no longer want anything good to happen to you, I guess Papa Johns can provide you with calories without being as bad as Domino’s or Little Caesars. Little Caesar’s Pizza is overrated, and is on the level of old Domino’s. Not Pizza. They offer a pizza below what pizza needs to cost and try to make it up on volume. You are not this hungry. Papa Murphy’s is highly underrated. Take and bake works well, they can keep in the freezer for a while if necessary, they are reasonably priced, no skill is required and you get a fresh out of the oven pizza exactly when you want it. By default there is too much cheese but that is easy enough to fix. Most frozen or take-and-bake pizzas are dreadful, but by not-in-New-York standards Papa Murphy’s rises to perfectly acceptable. California Pizza Kitchen is overrated and there is no reason to go there, but I think I remember that it is not as bad as the chain status and name would imply. Photos back this up, as the pizza is somewhat lifeless but at least is trying. Sbarro is properly rated. Sbarro is attempting to make New York style pizza. It sort of half succeeds. When you are at a rest stop along the highway grabbing a slice here is forgivable. Chuck E. Cheese’s is in no way focused on making real pizza, so it was never at risk for that. Probably Not Pizza. Overrated, but not because anyone is getting their facts wrong. Round Table Pizza is underrated. It does a good job of letting customers get what they want and consume the pizza at the right time, which goes a long way, and it makes the most of what it has to work with. I ate here a lot with other Wizards employees when I lived in Renton. This isn’t a great pizza but it is surprisingly solid. Beware the things that claim to be pizza, but that are not pizza. The family term for this is a PSO, or Pizza Shaped Object, but usually they are not quite even that – they are too small, cut the wrong way, not think enough to plausibly pass. Nominally, they include the three central ingredients, but do not be fooled. They fall into a few categories. The first are the non-pizza chains. You can tell these because their pizzas present as masses white, with two for one specials. The second are the 99 cent pizza places, the scourge of modern New York. I used to think it was drug stores or banks, but I was wrong. It is dollar “pizza.” At its best, this is a way to eat lousy on the cheap, and usually it is not even that. The third are the convenience products. They are offered at places one would not naturally expect pizza from. Your natural instincts are correct. This includes when pizza is on the menu in an otherwise respectable restaurant, but this comes as a surprise. This also includes almost all frozen ‘pizzas’. That is all. Tip well. This entry was posted in Good Advice and tagged Advice, Guide, Optimization, Restaurants. Bookmark the permalink. Huh. I am fairly confident you used to say Dollar Pizza did count as pizza, if only barely. In anycase, Dollar Pizza varies. 2Bros is greasy-in-a-bad-way that makes me slightly sick to my stomach. The dollar pizza near the 23rd street 1 train entrance was, by contrast, “pretty good” last time I checked, as was on somewhere around 46th and 3rd ave. The best dollar pizza can get to a grey area where it is sort of pizza, if the slices are kept small, but this is the exception rather than the rule. I think I was unduly influenced by a few not-THAT-bad experiences right when the phenomenon was getting started. Do you share memories of having told me that dollar pizza was not that bad? I notice that I am confused about this. I do think I said that at one time, comparing it to what one might expect. You can certainly do worse than the best dollar pizza, and many do (e.g. some of the chains). My best guess for why is that “not that bad” means different things in different contexts, and my views likely did evolve a little. Good post. Not what I expected though. This is very much a teach a man to fish post, and for some reason I figured you would just provide the enumerated list of best places to go for each style. There are not so many contenders that it’s impractical (e.g. for New York / Italian style hybrid pizza hop on the Q train and go to Di Fara, anything else is just satisficing). Anyway, I liked the post a lot, but I noticed I am surprised. What about the homemade / Ken Forkish / wood fired type thing? Ken is doing Italian-style, based on my quick Google search. Homemade is a LOT of work. I’ve done it when I lived in places without good pies, and it can be fun and rewarding, but I think getting it to good-pizzeria-level is very hard. But if you enjoy, go for it. Make sure to make your own dough! What’s your opinion of the new breed of fast-casual fresh-baking chains like Blaze or Pizza Rev? This is one restaurant trend I’ve been happy to see occur. I very much enjoy being able to specify the amounts of the several toppings (three at maximum is my maxim) and the degree of baking (i prefer slightly well-done). The freshness of the toppings can be seen, and each item tasted beforehand. I’ve never even seen either of them, so it’s hard to say. I used to travel far more than I do. Certainly fresh-baking will give them a huge leg up – this half-saves many otherwise pretty bad places. Yeah, that sounds right. The best pizza place near me is named after an actual person (they even have a little memorial sign near the door talking about when the original owner passed away), they only take cash, no credit, they don’t deliver, and they sell absolutly nothing except for pizza. Not even the normal side dishes like breadsticks or whatever, nothing but pizza. You walk in and there always are about 12 large Italian guys and a row of oven and a long counter. And it is the best pizza anywhere near me; the best crust, especially. I would also say that, at least in most places, you might want to avoid any place that tries to charge too much for normal New York style pizza, because in my experience they’re probably doing something seriously wrong somewhere.